Have you ever been out in the wilderness and realised that you did not have enough power on your cell phone or your tablet? You are not the only one who has gone through that awful situation, and you definitely want to avoid it from happening again. It is not just about using your phone to play games or take some pictures. It is actually about being able to communicate or contact someone if you find yourself in trouble. For that reason, we believe that having the best portable battery is essential for any outdoor activity. 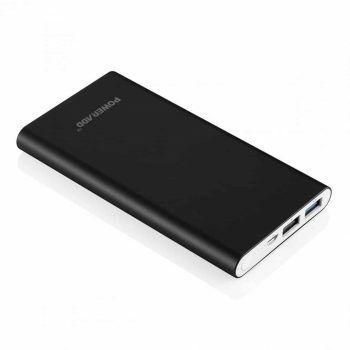 When it comes to portable batteries, you have to be really selective since you do not want to get one that charges your devices really slow, or even worse, that does not charge it at all. That is why you have to make sure you buy a high quality one that works whenever you need it. That being said, take a look at the following features to determine the most important aspects a portable battery should have. The first thing you want to look at is the compatibility. Not all portable batteries are going to work for all devices. If your device is not compatible with the battery, then it will not work. You also have to know how much power your device needs to be fully charged. If the battery cannot completely charge your device, it is not really going to do much good. So, make sure you get a battery that has at least enough power for a single full charge. Another aspect of compatibility is having the right connectors for your devices. If your battery does not have a cable that connects to your phone or tablet, you could be in the same position, anyway. Another important aspect is how durable your battery is. You have to make sure that it is going to last a long time even under strenuous use. Think about the circumstances where you will probably to use your device and make sure you choose something that is going to be okay under those conditions. You have to buy one that will not break easily if you drop it, for example. You also have to make sure it is going to stand up to a lot of recharges. Just like anything else you plug in, your battery is only going to work for a period of time. Make sure that is a long time. You should select something compact and easy to carry, and not every battery pack is small and fits in your pocket. Some of them are much larger and may require carrying them in your backpack. In order to make the right decision, just choose a small and lightweight battery that matches with the devices you will charge. While you might not think about them, there are actually some additional features associated with battery packs. A few of them come with different connectors to be attached to different devices; some others have different currents available. A couple of them have a flashlight or a hand warmer; and some others even let you know how much battery power is left with little level indicators. Once you have learned that, it is time for us to show you what we believe are the best portable batteries on today’s market. Description: Available in several different colors, the Jackery Mini 3350 mAh Portable Charger is one of the smallest external battery charger and power bank you are going to find. It is so small and light that you can easily put it in your pockets or in any bag. You will be able to carry one or more than one because they’re also really cheap, especially for what they are able to do. 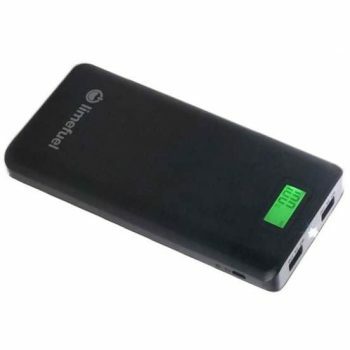 They provide a 3350 mAh rechargeable battery and can fully charge an iPhone, Android or iPad once.This battery uses a Panasonic Grade A Li-ion cell battery and has 4 different layers of protection to keep your mobile device safe. Also, it can be used more than 500 times and it has a Mini USB to USB 2.0 cable. Unfortunately, the on/off power button tends to get pushed when it is stored in your backpack or pocket; it loses its charging capacity over time; and it takes too long to charge any device. 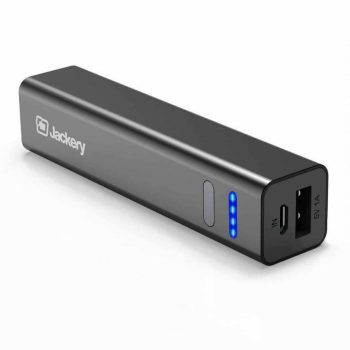 Related: We also recommend the Jackery Giant+ Dual USB Battery Charger since it is an ultra-high capacity unit that simultaneously charges 2 devices and also is compact for your trips and camping activities. 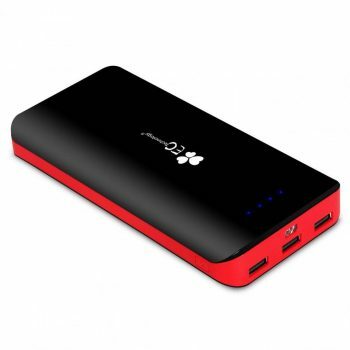 Description: The Easyacc Power Bank is built to provide a whole lot of power in a small package. It can charge multiple phones or devices at the same time, which definitely improves the speed at which you can get back to the other things you need to do while traveling. 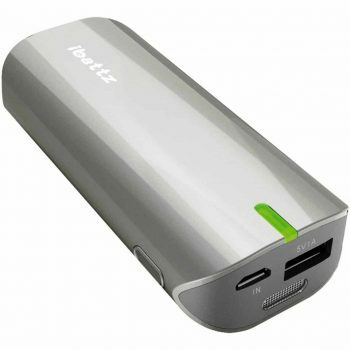 Since it is quite big compared with most portable batteries, it provides up to 5 charges. Also, it can hold its own charge for up to 6 months without losing integrity, which means that you can store it in your emergency kit; and it comes with a micro USB charging cable, which makes it compatible with a lot of devices. However, its main downfalls are that it does not charge your phone while you are using it. In fact, it seems like it consumes energy. Also, it charges slowly, and it does not always reach 100%, not even after 10 hours of charging. Related: Also, you should take with you the EasyAcc Mini Portable Bluetooth Speaker since it is small, portable, has a FM function, supports Micro SD Card and works with rechargeable lithium batteries. 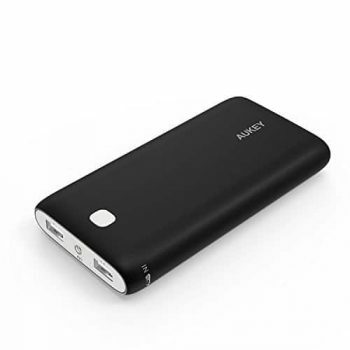 Description: The Aukey PB-N15 External Battery Charger is capable of charging most iPhones up to 2 times and then charging a Galaxy phone at least once. It does this at a quick pace, as fast as the device allows, and still provides protection against overheating, current and overcharging. It was designed to be quickly and easily attached to your device and be easily stored in a pocket; it can be connected to just about any device, including smartphones and tablets; it is easy to use; and it let you see when it has completely charged a device. Related: If you are one of those people who like to always keep an eye on your phone, the Aukey Car Mount Phone Holder will become your best friend. It has a ultra strong magnet that securely holds your phone, it is easily adjustable and removable, and it has a 24 month warranty. 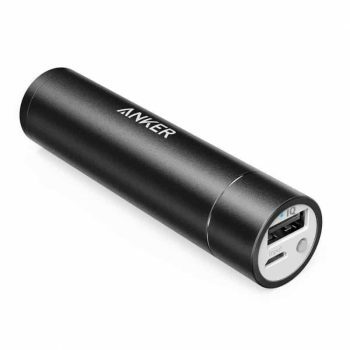 Description: With the Anker PowerCore+ you are going to get a whole lot of power in one small device. You will be able to charge a device in approximately 3 hours, which is shorter than most recharge periods. This battery also allows you to use your mobile device while it is charging because it is small and can be tucked out of the way. This works for most mobile devices through a micro USB cable. This battery identifies your specific device and then charges it as quickly as possible. It has a high capacity and, because it’s so small, it can be stored in your pocket or in a bag. You will be able to easily take it with you anywhere you go and you will be able to get a good charge on your device while you are away from other sources of power. Some users have said, unfortunately, that it holds less and less power every time it is used, so it would not last for long. Also, they said that the instructions that the unit brings are not helpful at all, and that the power level indicator is really uncertain. Related: The Anker Quick Charge Dual USB Car Charger is what we recommend when it comes to car chargers. It is really compact, it has two USB ports, and it has enough power to charge phones fast. 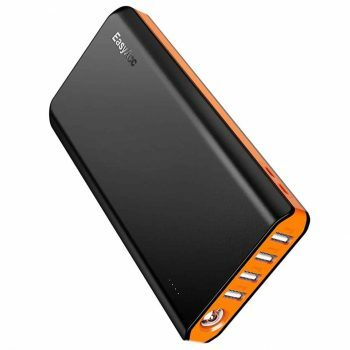 Description: If you are looking for an all-around unit that is going to give you a little of everything you are looking for, then the EC Technology 22400mAh Portable Charger is definitely what you should get. It charges quickly over twice as fast as a 5 V 1 A it is made with A+ lithium-ion battery cells that, after 24 months, it would still have over 70% of the original battery life. With the 22,400 mAh capacity, it can charge a phone over 12 times, and a tablet at least 4 times. Its most important characteristic is that it comes with an integrated LED indicator to show you the power status; and it can charge multiple devices at the same time. Additionally, it includes a LED flashlight to help you find your way in the dark. One of its major downsides is that you have to always keep an eye on it because, sometimes, it just turns off after a while, stopping the charging process. Also, it stops working at all only after 6 months of regular use; and people say that it does not charge tables or devices with big batteries. Related: The EC Technology Robotic Vacuum Cleaner is a really great tool offered by EC Technology. It can clean up to seven times a week; it was design with an ultrasonic wall technology to avoid obstacles and is really small and compact. Description: The Limefuel Lite Pack Charger is designed to help you get the charge you need within a short amount of time. It helps you see exactly how much battery power is left in the device with a digital display right on the front that gives you a percentage reading so you are never uncertain if it is ready to go or not. Also, you can charge two different devices at the same time, and it is compatible with most smartphones and tablets. It is designed to be small, compact and lightweight, so it fits easily into your pocket or into a bag without adding too much extra pounds. The charger offers plenty of protection against short circuiting, discharge, overcurrent and explosion, and it can last over 500 use cycles. Nevertheless, people that have bought this unit have stated that the USB port is really weak, so it breaks easily. Also, they pointed out that the battery is pretty big compared to others; that the reading percentage might not be 100% accurate; and that the battery, after a few months of use, will not charge more than 35%. Related: The Limefuel Fabric Case is something pretty useful when it comes to store small things. It is made of a resistant fabric, has built-in pocket and built in strap, and has a soft touch interior. Description: The Cheero Panasonic Battery can be connected to just about any device you might have, including iPhones, Android and tablets. It offers multiple full charges; and it is very light. It’s built to charge in about 8 hours and can be used about 500 times overall while still maintaining the high standards you expect. All you need to do is plug it into the wall and it will be ready to go in no time, then you plug it into your device and you’re going to be ready to get back to whatever you want. However, buyers say that it is made of a weak material. In fact, people say that the front plastic falls off easily, and that the plug feels loose. Also, they found that the unit cannot give you more than 50 hours of charging altogether, so it will not last for more than 4 months. Related: We also recommend the Cheero DANBOARD Lightning to USB Cable since it has a really cool design, the cord is made of a stylish fabric material, and it even let you know the charging status due to the lights that their “eyes” display. Description: If you’re looking for something ultra light, then the Ibattz Vogue Battstation was design for you. It does not matter what type of device you have, this unit is capable of quickly recharging nearly any mobile devices, from smartphones to tablets. Also, since it is very small, you can slide it into your pocket for easy carrying or charging on the go. Additionally, it shows the battery level and charging status with four LED lights; it has 3 power tips to make it compatible with a lot of devices, and has a flashlight that comes in really handy in the dark. Unfortunately, buyers have said that it stopped working after 9 months of regular use; that the cord is made of a really weak material, so it breaks in no time; and that it charges really slowly. Related: If you are looking for a case that also recharge your iPhone 6 plus, then we definitely recommend the iBattz iPhone 6 Plus Case. It has a protection against knocks and drops, has a slim design and allows perpetual charging. Description: The Poweradd Pilot Portable Power Bank is designed to help you charge absolutely anything you might have with you in a very short amount of time. It can be plugged into more than one device at a time without any problems and will get you fully charged twice as fast as most charging units. It is small and compact, so it’s easy to carry in a bag or even in your pocket. Also, it has an auto detect function allows it to figure out what type of device it’s plugged into to accordingly charge it for the best results. Additionally, the product has 2 years of warranty. 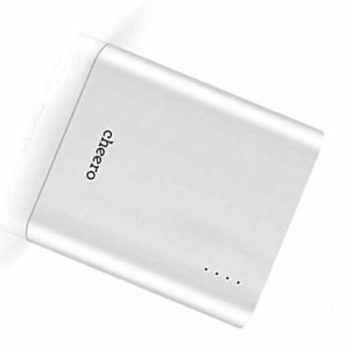 This portable battery’s primary downside is that just after the first used, it starts losing its efficiency because it no longer charges devices but just holds the battery level. Also, users say that the cable does not connect well to battery; and that it barely can charge two phones at the same time. Related: The Poweradd Apollo Solar Charger is also another option for portable batteries since it can be recharged with solar energy. Also, it offers up to two charges; it is portable and compact; and has a LED flashlight which should come in handy in the wild. Thanks to the previous information you know that there are a lot of different battery chargers to choose from. The only way to know which one is the best for you will depend on your device and your needs. Basically, you have to take a look at everything we explained, and select one of the units we listed before. So, what battery charger do you like the most? Do we leave some of your favorites out of our list? Share your thoughts on the comments!